The former Tánaiste paid tribute to Taoiseach Leo Varadkar and thanked him for his “loyalty”. 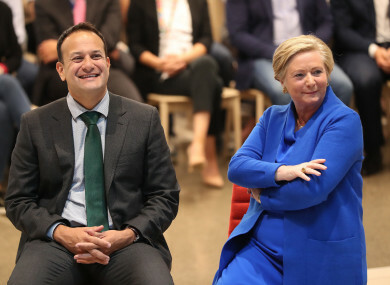 Taoiseach Leo Varadkar and Tanaiste Frances Fitzgerald at the official opening of LinkedIn's HQ in Dublin. FORMER TÁNAISTE FRANCES Fitzgerald says that she wants to “vindicate her good name” and thanked Taoiseach Leo Varadkar for his loyalty on the day she resigned. Her departure follows days of controversy around the legal strategy used against Garda whistleblower Maurice McCabe during the O’Higgins Commission. Fitzgerald stepped down today over her handling of the Maurice McCabe affair. However, while her resignation seemingly avoided a pre-Christmas general election, she was back in her Dublin Mid-West constituency this evening seeking the backing of local Fine Gael members to run the next election for the party. Fitzgerald told colleagues about her resignation at a meeting of the Cabinet which ended shortly after 12 noon. Speaking in Finnstown Castle Hotel in Lucan as she and local councillor Emer Higgins were chosen to contest the election, Fitzgerald said that the last number of days have “been tough”. “Tonight I have come here not just to get your nomination, but to get your backing. It has been the greatest honour of my life to serve in government, but I do believe that my resignation was necessary to avoid what we all know would’ve been an unwelcome and potentially destabilising general election. She added that she had decided to resign due to the “unprecedented” challenges facing Ireland. I’ve put the national interest above my personal reputation. She paid tribute to Taoiseach Leo Varadkar and thanked him for his “loyalty”. “I really want to thank the Taoiseach for his loyalty and support. I’ll always be grateful to him for giving me the opportunity to serve, and as he said this morning, he wants me to continue to play a full role in political and public life at the highest level, and that’s what I want to do. She said that it was “hard to get facts on the table”. It’s also been very hard to get facts on the table, and I want to say that to you, amid the very frenzied political media atmosphere, throughout my career I’ve always wanted to act with integrity and responsibility. Email “'I want to stay at the highest level of political life and vindicate my good name' - Fitzgerald comes out swinging”. Feedback on “'I want to stay at the highest level of political life and vindicate my good name' - Fitzgerald comes out swinging”.